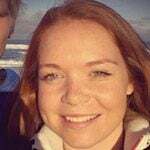 Juliane has left her native Denmark to study at the University of Otago in New Zealand. When she’s not studying she loves adventures, socialising and baking healthy treats. First of all, I need to say that you don’t have to travel outside of New Zealand when you just have arrived. Seriously, this country has everything! But the houses can be cold during winter and you can get tired of the freezing nights and mornings. The fact is that I left Denmark in the very beginning of summer. I missed a very warm summer and “returned back to winter time in New Zealand in July. Now I really miss the sun, summer and warm weather. These things combined ended up with a spontaneous booking of flights to a small island in the middle of the Pacific Ocean called Rarotonga where we could escape the winter for a while. Though it actually was winter on the island the temperature was around 25 degrees and the water temperature should be around 22!! Yes I know, it sounds amazing and so it was. We left Dunedin driving with a random guy we found on the internet (meaning we spent $20 each for the ride) and went to Christchurch where we slept over at our flatmate Amy’s. Very early Friday morning we had to catch a flight to Auckland. But Auckland isn’t that bad actually. You can go to the city if you have a lot of time but we had “only” 7 hours to spend around the airport. Nearby we found a Countdown and some cafes where we could get a cheap lunch (compared to the airport) and a nice coffee. 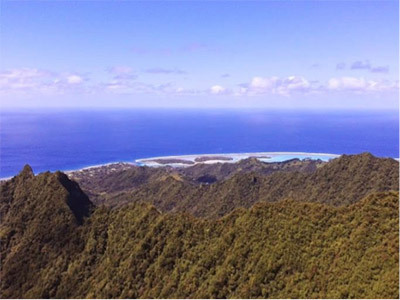 In the evening we left Auckland and arrived on Rarotonga at about 2 o’clock in the morning. The owner of the hostel we had booked a room at picked us up and drove us to the hostel. 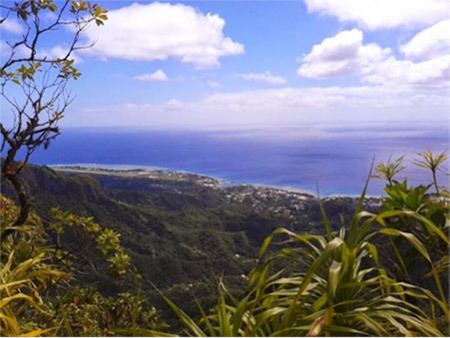 On Rarotonga two hostels are available and of course a lot of resorts. But we felt like cheap accommodation and why pay a lot for a hotel room you won’t be sitting in all day anyway because of the sunny and warm weather? We travelled around the island by hitchhiking but it is also possible to take the bus which drives around the island all day both clockwise and anticlockwise. But people on the island are very relaxed about hitchhikers and it is easy to get a ride. 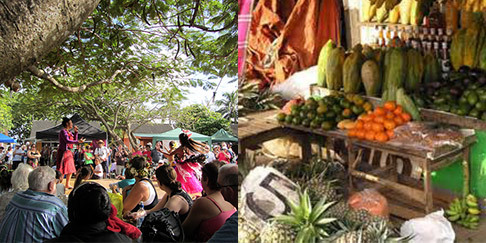 On Saturdays, there is a market in town (the only “town” on the island located on the north side) where the locals sell food, fruit and souvenirs. The market is very nice, the atmosphere is relaxed and there are a lot of different and interesting smells all over. In town, there are a few different shops or supermarkets and we got very surprised about the expensive prices. Everything is expensive but if you buy fruit from the locals you can save some money. On the island, it is possible to find fruit by yourself though. One of the first days we found a lot of bananas and pawpaw/papayas were also common. Coconuts are all over and we learned how to find the good one, how to open it, how the milk was possible to drink or use for cooking and how amazing the coconut is inside for snacking! We already felt it was like paradise that you just can pick up the fruit you want to but the locals told us that the season during winter was a poor period compared to the tropical fruits the summer provides. 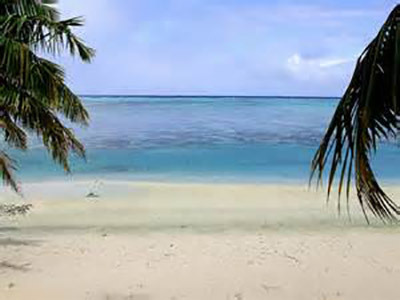 The island is surrounded by a reef which means that the water is very safe to swim in. 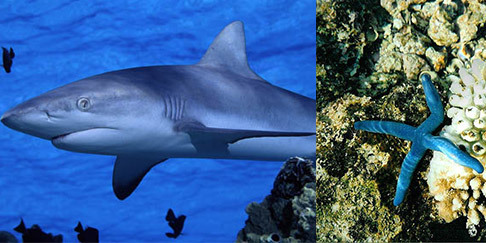 If you are “lucky” you might find reef sharks but normally you will only see plenty of coloured fishes when you dive under the surface. 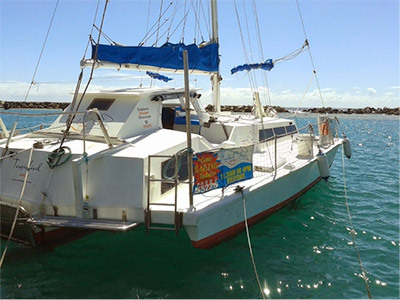 The whole reef contains a lot of fish and corals and it is amazing to experience. Søren and Rasmus were diving all day long while I rather spent my time in the sun on the beach reading a book. Sometimes I took a dive of course. It’s a must!! One day Rasmus and I hired bikes to bike around the island. The island isn’t that big and I think it would be possible to bike around in a few hours. We went on a day tour where we had a few stops around the island. First stop was in town, where we bought some snacks and lunch for the trip. Next stop was just outside town where a “small” track went in around the middle of the island. We decided to go for a small walk to see what the track was about. Almost 3 hours later we were on the top of the highest hill on the island where we could see all the way around. The track had got much longer than we expected because we found the “wrong” track. But the view and experience made the whole effort worthwhile! The amazing view on top and the track was exciting and at some points got very dangerous. We walked on very narrow tops of high hills and many places that were steep with ropes hanging so you could climb the hills. Such a cool track and we both got a feeling of satisfaction when we finally made it all the way to the top. We got very tired though and we were glad that we brought snacks and water. What Rasmus and I experienced and realised over and over again is that we always have to trust our navigation skills and just make it along the last bit of the track before we give up. We know that the last bit of effort is all worth it. The flight tickets were a bit expensive and it seems a bit stupid when you realise how easily and cheaply you can travel from Denmark to Turkey when you want to escape for the winter. In New Zealand, the common thing is to travel to Australia since other countries are just too far away. 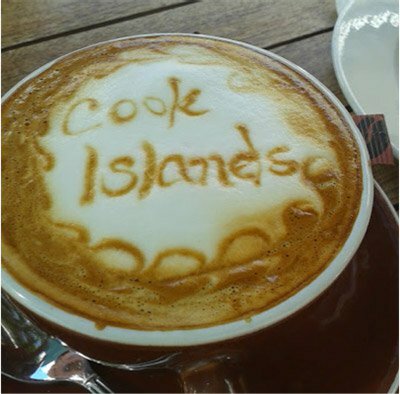 But compared to Denmark, New Zealand is very close to Fiji and Cook Island. That’s why you have to go there when you actually are close to these places. I spent $981 on my return ticket and I paid $40 for the bus back to Dunedin from Christchurch. On the island, I spent a lot of money but many of the best experiences were free. With the exception of a $75 boat trip that wasn’t worth all the money. It was nice to see the island from the water and it was cool to dive outside the reef where it is very deep. But the “lunch” (read snack) seemed like a joke. Maybe the experience would have been better if we had seen some whales. We had seen a lot from the coast and it would have been cool to be closer. But they didn’t come around this day so I wouldn’t recommend it. Next articleMiddlesex to Humber – Dubai to Canada: Should I believe in Destiny?